The system provides you with a way to get a digital signature from a customer during the reservation process. There are two sections in which you can place the digital signature. They are located at the confirmation and pick up step of the reservation process. This article is a step by step breakdown on how to enable or disable the digital signature. How do I enable or disable the digital signature? Firstly, navigate to Car Rental under the Car Rental category in the settings, highlighted in dark blue in the picture below. 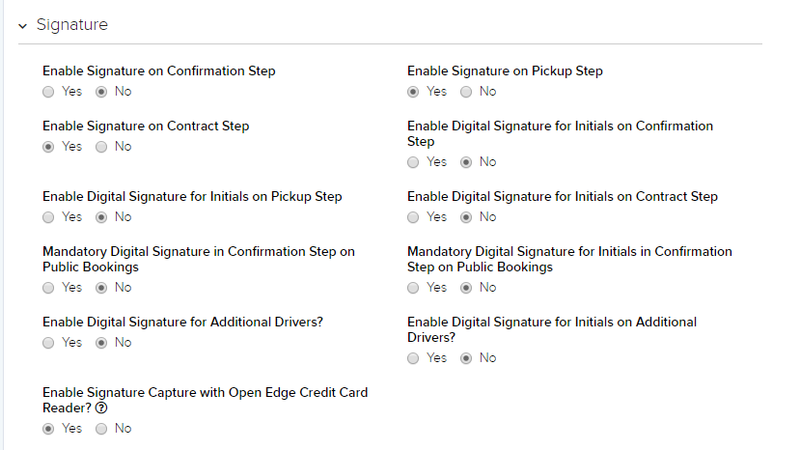 Next, scroll down to Signatures, you will see the Enable Signature on Pickup Step and the Enable Signature on Confirmation Step. By default, the system enables both the signatures. You can disable one or both the signatures to suit your company needs. Next, head to Settings > Fleet > Company Brands. Under the Advanced Brand Settings section, click “Yes” on the Enable Digital Signature on Rental Agreement. The signatures at the confirmation step and the pickup step would appear at the bottom of the page as in the picture below. When signed, the signatures will appear on the rental agreement in the signature box, as shown in the picture below. You can add in additional terms and conditions for the customer to read at both of the steps before signing the agreement. This text can be customized in Settings > Fleet > Company Brands > Text Settings. 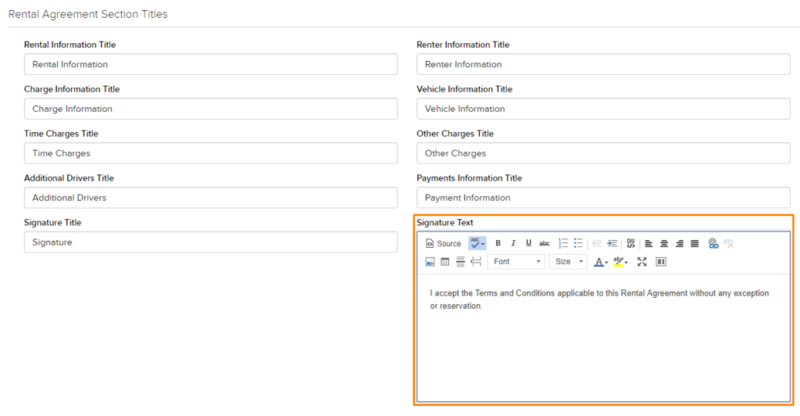 You can also change the accepting terms and conditions text in Settings > Car Rental > Car Rental > Rental Agreements > Rental Agreements Section Titles > Signature Text as shown in the picture below.